The „High Z“ sketch is almost as simple as the most basic sketch. // This sketch sets all input pins to "high z". // That is they will be high impedance / floating. It sets all pins to input and disables any pullup resistors. It exhibits the same behavior as the „empty“ sketch we started with. 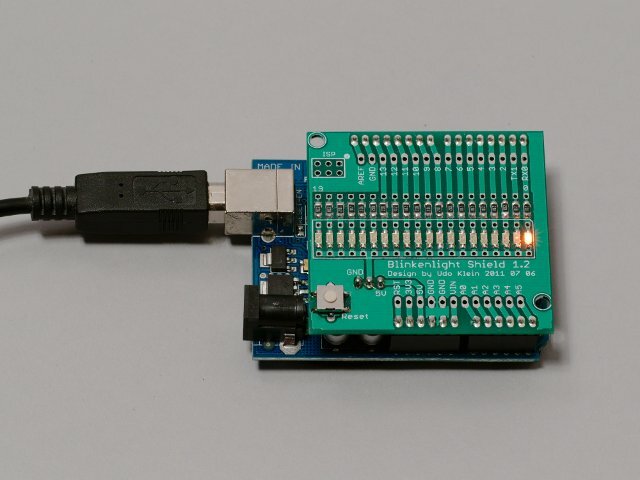 It only serves to demonstrate that this is the „default“ behavior of the Arduino. The output looks exactly the same compared to the “Empty” sketch. The next sketch will be more interesting. We will pull up all pins. that looping through all pins from 0 to 19 does not work on 2560.
to 19. So some mapping function would be helpful to get a consecutive sequence of pins. the same issue was brought up with this comment before. This is tricky. Basically my shield and the experiments are designed for “standard” Arduinos and the Blinkenlighty. I know that the other Arduino variants share the same connector they are not 100% software compatible. However I do not own all these variants and thus can not test appropriately. The question is who should provide the hint. In my opinion this should be stated in the manuals / wikis of the Arduino variants. And of course somewhere you will find it. On the other hand I do not like to be blamed for things that are out of my control. I would be willing to provide such a hint on my pages. The solution to the comment I mentioned above is not that obvious to find. So here comes my question to you: where on my pages would you expect such a comment and how extensive should it be? As I got the Franzis pack with the shield only and no information on compatibility besides a link to your blog, the first impulse was to look for the physical compliance in Experiments->Hardware. One extra entry for “Compatibility” with a “works with… ” table would be fine. People could add comments on additional working boards. In an extra column you could add a column indicating if your sketches work “unmodified/with modification” on a given Arduino type and provide a link to the modification as an extra page in Experiments (or moving all sketches one level down to “Experiments->Sketches” and adding the modification page there. Good idea to put it to Hardware. This month I will most probably not find the time to add this page. However I aim to add it in September.